Mohammed Hassan Is this guy for real? This blog has been lying still for quite a while now, since the media coverage of "the Mohammed crisis" as this series of events has been dubbed in Denmark. As some of you may have seen, a video was released today by a supposed member of the Al-Quida, Mohammed Hassan, calling for violent action towards Norway, Denmark and France. What I wonder is: Is this guy for real? I believe that most people are aware that the publication of the drawings brought unforeseen consequences - both with regards to the perception and emotional response in Islamic communities as well as political and economic implications. However, it seems that the conflict has cooled down (at least to the extent it is covered in western media) over the last couple of months. Then, along comes this guy with a 35 minute video full of hateful and aggravating messages. One of the positive results of the discussion started by the Mohammed caricatures (in my opinion, at least) is an increased awareness of the differences within Islamic communities and several Muslims have seen this as an opportunity to verbalise their opinions and speak for them selves. While this may not have lead to agreement regarding whether it was reasonable to publish the caricatures, it has definitely helped bringing forward a higher awareness of differences in opinion and justifiable responses in the conflict. Overall I believe that we are the better for this episode, since we now have a whole new range of people that have established a communication channel to make themselves heard in relation to cultural and political issues relating to religion. Who is this Mohammed Hassan talking to? Obviously there might still be certain population groups and communities where these kind of messages might find fertile ground, but it is my personal opinion that this kind of publication should no longer be seen as a "typical" communication from Islamic communities in the world, yet it is clearly easier to get global coverage when the message centres on violence. Let us try to hear some of the responses from some you that do not agree that this is the image Islam should have in the media! Over the last week, the responses to the conflict have escalated - both in scale and in severity of responses. The discussion has become increasingly complex and polarized. I think that there are currently a lot of discussions that need to be addressed in relation to this conflict. First of all, while it is important to respect that there are differing opinions on the severity and range of justifiable consequences in response to the publication of the cartoons, it is vitally important for a continuing constructive dialogue that these responses are kept within the limits of diplomatic, economic, verbal or written responses. The attacks on embassies are completely unacceptable. Indeed, a the cartoons have been perceived as a provocation, but in any conflict, one part chooses to shift from verbal to physical means and in my book that is indeed the one to blame for the violence. As for the western world, however, it is also important to recognize that part of the debate in what might be called the "Islamic world" is spurred by other issues than the drawings alone. There are regional and national political conflicts and interests involved that are not immediately transparent without detailed knowledge of the inner workings and current political issues in these countries. Also we must recognize that both sides of the debate are exposed to biased media coverage. While I do not believe that a more detailed or unbiased coverage might provide any justification what so ever for the acts of violence, I doubt that every single participant in these actions have responded to the cartoons actually published in Jyllandsposten alone. I understand that we both have very clear stands in this debate. In my personal discussions with Muslims, I have also noted a tendency to bring questions like the ones you put forward into the debate, such as: What do you know about Islam as a religion? about the prophet? etc. actually have some differences on precisely the issue of depictions of the Prophet Mohammed. While I agree that informed opinions are better than uninformed ones, I do not, however agree that the question of what I know about Islam as a religion is the central issue here. I am not saying that it is unimportant, as insufficient knowledge about the Qur’an might have been one of the explanations the cartoons got published in the first place. Rather I would argue that the conflict is now only indirectly linked to the cartoons. The outcome of bringing physical attacks into the conflict has changed the focus away from whatever excuse is brought forward to justify these acts of violence and in stead, the discussion has now become a matter of protecting the fundamental principles in western democracies. Strange it is, that men should admit the validity of the arguments for free discussion, but object to their being ‘pushed to an extreme’; not seeing that unless the reasons are good for an extreme case, they are not good for any case. While I understand that the publication of cartoons has been hurtful to many Muslims, it is imperative that the freedom to express your opinion does not become inhibited by the fear of consequences. I am afraid that the diplomatic relations of some of the countries actively involved in this conflict have lasted severe damage, and I do not believe that Denmark is the country that has been hurt the most. The point you are trying to make (freedom of speech) is a crystal clear one and I believe that every human being of a bit of mind would agree with you.Your article is so far so objective and constructive however, there are many gaps and weaknesses underneath. Like you like many other people in today's world you talk about things that you neither know nor understand and you come up with blank terminologies with neither definition nor explanation. You turn the freedom of speech into a highly over-rated commodity in order to justify and promote freedom of racism that has been a pointed ugly feature of the western society in Europe in particular for many years. Let me tell you that freedom is not a green card to nasty speeches and/or actions that you can entitle yourself to have regardless how harmful they are and how far they can badly hurt the feelings of others. "WHAT YOU PEOPLE SHOULD UNDERSTAND THAT YOUR FREEDOM ENDS AT OUR DOOR STEP"
You talk about violence, terrorism and harm principals using your own individual measuring scale to turn facts into meaningless big words. what's the bottom line of the harm principals you are talking about??? What do you know about Islam as a religion???? What do you know about Prophet Mahammad (PBUH)???? What do you know about the Islamic religious teaching???? What do you know about the outer world beyond your country's borders???? You do not know any further than the distorted materials that you are being fed by your racial-based media. Moreover, you people do not even know anything about Christianity nor good manners nor social peaceful living nor positive dialog. Your opinions and visions can be welcome all the time as long as they are objective and aiming to build a bridge of understanding between people of different cultures, religions, races and colors. If you don't believe that the logic of freedom of speech should be based on respect and appreciation of one another then you're not in a position to tell our people how to react and you can't blame our people for how far they go with reactions bearing in mind that you people drop the respect and appreciation off your calculation violating the very most holy part of the Islam just for being ignorant and helpless. In their article, the two editor, Jihad Momani and Hisham Khalidi had chosen to bring 3 of the 12 caricatures originally posted in the Danish newspaper Jyllandsposten and argued that the response from the Muslim communities should 'be reasonable'. The arrest occurred after the King Abdullah of Jordan had condemned the publishing as 'abuse of freedom of speech'. While I am no expert on the intrinsic details of the Jordanic judicial system, this certainly appears as a very different approach to free speech than the one found in most western democracies. Perhaps, it could be said that this sheds light on one of the fundamental differences of the perception of the role of free speech in Islamic countries compared to what is traditionally referred to as 'the western world'. The majority of diplomatic responses to this conflict, as well as most of the interviews with imams brought in European television has included requests to the Danish government to let the publishing of caricatures have consequences - ranging from apologies to legal consequences. This has not happened and hopefully never will. The reason for this is that the government does not regulate free speech. In Denmark the freedom to express your opinion non-violently is a constitutional right. Therefore, there is a conflict in the perception of what the Danish government is able to do about the matter, since responding with any kind of consequences for the people involved in the act of publishing would in fact be in direct conflict with the foundation that provides and justifies the position of that same government. While it is difficult for me to say whether this example from Jordan can be used to generalize about the perception of freedom of speech, it never the less serves as an example of the differences of the roles and responsibilities of media between Denmark and Jordan. As for Mr. Jihad Momani and Hisham Khalidi, I can only hope that the consequences inflicted upon them are negotiable and of limited severity. The conflict over the caricaritures has now gone to far. This event illustrates the very foundation for this site, the need to be able to discuss calmly and in a civilized manner even when having very different viewpoints. Turning to violence is not the answer! The ironic point of this event is that the protesters will not achieve anything by this action. In stead, it is my prediction that the action will be condemned by most of the western societies. Furthermore, this act directly challenges a fundamental property of the concept of freedom of speech. The right to express your opinion without violent or physical repercussions. The harm principle has now clearly been broken in this conflict. It is important to understand, that while the agitated nature of this conflict may give way to expressions of anger in many forms, this event will in all likelihood strengthen the response from the western world and further escalate the tone of the debate. In my personal opinion, violence cannot be a justifiable response to verbal, written or - in this case - illustrated expressions even if these are offensive to you. We can only hope that the impact of this even will leave place for discussions. I am afraid that the requests for apologies after this point will be in vain. In order to fulfil the goal of this site - to present both sides of the argument I would like to extend an invitation to whoever feels that they have something to contribute to the discussion. The fundamental question is, of course whether either of "Deference of religion" or "Freedom of speech" can be said to have any prevalence over the other. My personal standpoint is that there is no clear answer. This has especially been illustrated by the variety and strength of responses to this debate. It is, however important to recognize that there are no black or white answers to this issue. It *is* important to recognize the individual's freedom to express their point of view - whether this is on religion, morals, sexuality or the actions of others - should be recognized to the widest degree possible. This establishes solid foundation for individual freedom and also establishes a set of constraints implicitly governing this freedom. The fundamental question emerging from the current discussion then turns out to be a debate of whether the ridicule of other's religious or cultural belief or heritage can be said to be harmful to them. In the current discussion, it is also important to keep in mind the specific background of the publication of the caricatures, namely the problem of finding illustrators to illustrate a radical book about the prophet. The issue at hand does not call for a discussion of the actual content of this book, but the reaction (in the form of publication of the drawings) and whether this can be justified as a strike against self-censorship based on fear of repercussions. I just received this post regarding the category names of the links sections. I think it makes a good point and will update the "Respect for religion" category name accordingly. In the heated debates on this issue it is important to keep a maximal amount of rhetorical precision. Hopefully this furthers clarity in the discussion. I just discovered that the comments unintentionally were restricted to registered users.. It has been fixed now, so please feel free to add your comments. drawings published by the Danish newspaper Jyllandsposten. 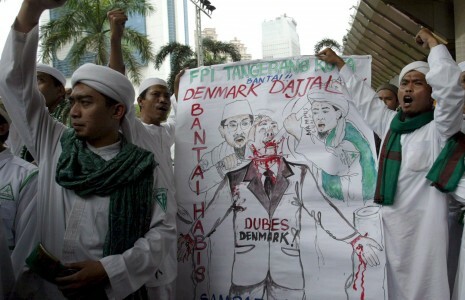 This morning, 'Activists' (in lack of a better word) invaded the Danish Embassy in Indonesia and - according to the news bureau AFP - carrying signs saying "Let's slaughter the Danish ambassador". Overall, the worst thing that happened during the event was activists throwing eggs at the embassy and the embassy sign. But in my opinion, it serves as an example of the importance of keeping this conflict on non-violent premises and favouring civilized discussion of the issues at hand. The most interesting point of this event is that the activists had not been informed of the messages conveyed by the Danish prime minister in relation to the case. After being informed of the content of Anders Fogh Rasmussen's message, the activists allegedly calmed down and left the embassy. If you know of any more details to this story, please post a comment. Thank you. After some consideration, I decided that the original category titles of the link section of this site might be considered by some readers to be biased. I have therefore decided to change the original titles from, respectively "AGAINST freedom of speech in this context" and "PRO freedom of speech in this context"
to something that hopefully reflects the relative viewpoints of the authors more precisely. The new headings will be, respectively: "Favouring respect for religion" and "Favouring respect for freedom of speech"
If you feel that you have any suggestions towards a better classification of the categories, feel free to email me. Welcome to the freedomofspeech.dk web blog. This site has been created to promote freedom of speech in light of the massive repercussions that have emerged as a response to the Danish newspaper caricatures brought by Jyllandsposten. Please note that is an important element of this site that both sides should be allowed to comment freely. We try to promote constructive dialogue. If you primarily feel like expressing hateful messages you are, of course, free to do so, but the goal is to provide a forum for real discussions of the issues involved rather than simple bulletins of hate. It is the express point of view of our team that the right to freedom of speech is an essential element in what might traditionally be put as "western culture". It is beyond doubt that freedom of speech is an integral part of the human rights as well as the foundation for democracy. The very right to believe and express your beliefs as well as criticism of others without violent response is the foundation that allows peaceful co-existence of religions and beliefs in modern society. This right must be respected and while it is unfortunate that the specific depictions brought by Jyllandsposten has caused indignation and hurt feelings, it should be received with the intention in mind, namely as a statement in the discussion of what limits are currently determining what differentiates between items covered by free speech and items regulated by laws concerning racism and discrimination. I am keenly aware that I myself is a product of the society and world that I live in. I do not in any way claim, that I am able to present an unbiased view. I do, howevever, strive to be reflective on my opinions and continually try to get the most detailed view possible. If you find that viewpoints or posts in this blog are grossly biased or downright wrong, please speak up! it is the best way to keep the discussion going and perhaps an opportunity to present a case that has a different foundation than my own. Why ‘freedom of expression’ defence is questionable in the Muslim dispute with a Danish publication.